Whether your wedding style is vintage chic, Great Gatsby glam or classic elegance, The Mansion offers a gorgeous setting for your unique creation. The polished oak floor spans over four thousand square feet, and the ceiling soars to almost thirty feet. 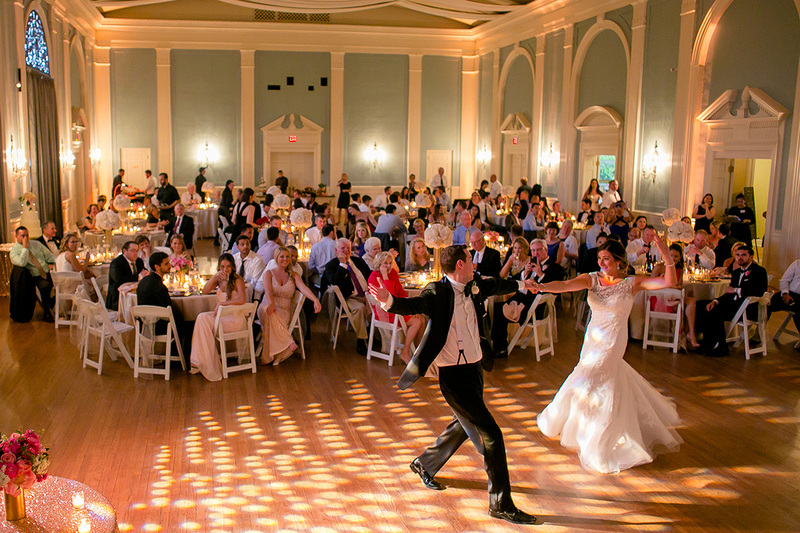 You may utilize the Ballroom for both dining and dancing, and a band or DJ can setup on the large curtained stage. The room is dramatically illuminated with vintage bronze and crystal wall sconces, for a total of seventy candlelight bulbs and a thousand sparking crystal drops! In the Nineteen-Thirties and Forties, the Georgian Room was an operating tea room. The original hat-check stand is there, along with hardwood flooring and wall sconces. 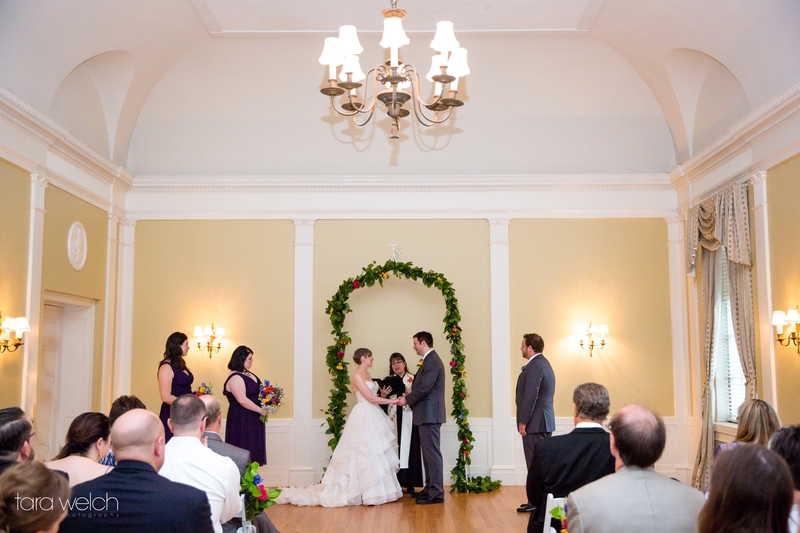 It is basically a ballroom in miniature, with tall, elegant windows and a vaulted ceiling. Step back in time by experiencing the intimate garden courtyard. Features include a babbling stone fountain, Greek-style pergola and flowering plants. 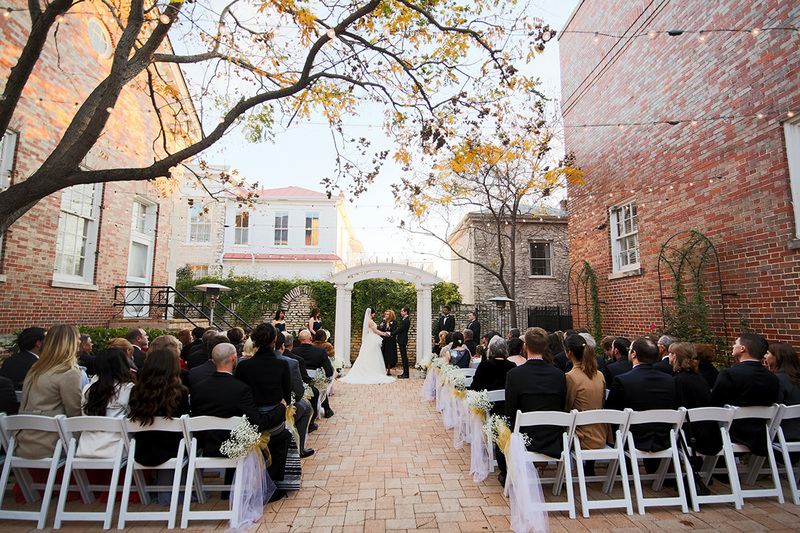 Accessed from the Ballroom, it’s a perfect spot for outdoor ceremonies, cocktails or just taking in the night air. Dramatic columns and expansive bay windows onto the Courtyard. A baby grand piano! Victorian couches and period table and chairs furnish this lovely space. A fireplace, a wall of golden mirrors and antique furniture. Chairs and sofas are clustered for relaxed and easy conversation. A collection of historic Texana, including books by and about notable women. It is a comfortable retreat with a fireplace and antique sofas and armchairs. The Mansion hosts only one event at a time. Even if you choose not to reserve the entire space, be assured your event is the only one happening. Except for support staff, you and your guests have use of the Mansion exclusively.